Influencer marketing is defined as “a form of marketing in which focus is placed on influential people rather than the target market as a whole.” Influencer marketing is a great way to leverage social prowess to reach your market in a way that increases restaurant sales. Consider this, 71% of customers are likely to buy products or services based on social media referrals. Having people connect with your food and brand takes more than just posting photos and commenting on your content. You need to find the most effective person who will attract diners that will actually patron and support your restaurant. Social media influencers have an incredibly powerful influence on the product within their specific and defined niche. Normally, they have a large following (typically over 10,000) that look to their account for photos, information, references and engaging posts based on the influencer’s authenticity. These loyal followers believe in an influencer’s review and recommendation because they find them to be credible and relatable. One post of positivity from a solid influencer could increase traffic to your restaurant dramatically. When it comes to modern-day word-of-mouth, influencer marketing dominates the industry. In fact, social media influencers can be more powerful than celebrities when it comes to promoting a product or service at a reasonable price. So, how do you find an influencer? Most influencers want to work with restaurants that have a solid brand. If you aren’t actively posting on social media, you will want to begin doing that as soon as possible. If an influencer is going to promote your restaurant to a following that has taken them time and money to build, your restaurant needs to look good. Have all of your logos, branding, content, and information as up to date as possible so you can create a good first impression on your influencer. You don’t need to have a ton of followers, but you need to show the influencer that growing your brand and having a professional presence is important to you. When it comes to what content to post to your potential customers, keep the text engaging versus promotional. Too many promotional posts can rub customers the wrong way, particularly ones that already love your restaurant. 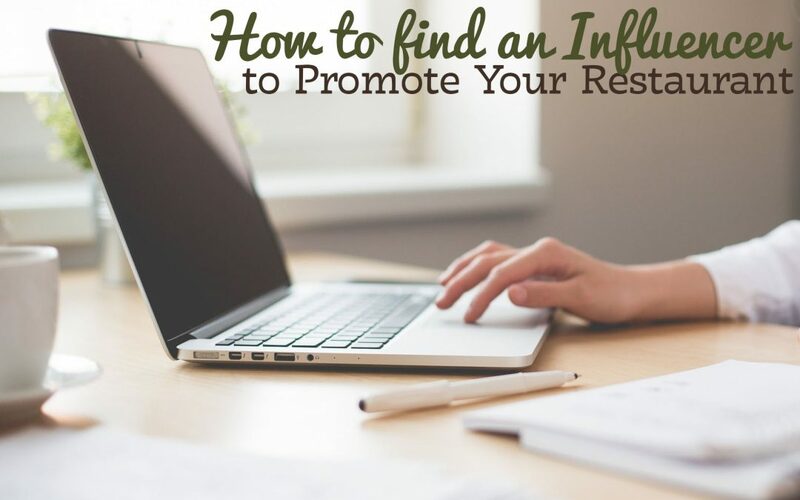 There are plenty of influencers out there to choose from and finding them can be difficult. Your main focus in strategizing this partnership is connecting with one that will drive the results you need for your restaurant. There are several items to think about when deciding on a an influencer. Pay attention to how many followers the influencer has. If there are thousands of followers, but these followers aren’t commenting or liking the influencers posts, odds are the influencer paid for fake followers to get influencer status. The amount of likes and comments should align with the number of followers their profile has. Make sure you find an influencer who will post content directly related to your business – food. If the influencer is posting anything but food, then they aren’t the right person for you. A quick way to find potential influencers is to search for food bloggers in your area. You will also want to decide which channel you want to use. If most of your engagement already lives on Facebook, try to find someone who also actively posts there versus Pinterest, Twitter or Instagram. However, considering how visually impactful Instagram’s platform is when it comes to content, it is the most preferred medium for getting customers excited about the content (food!) your influencer posts. So you’ve finally found the influencer you want to use – now what? To reach out to this influencer, you want to first establish a quiet relationship with them. Begin sharing some of the posts that they have, or comment and/or like their posts. This begins a slight introduction to who you are as a restaurant, and also opens the door to them that you might potentially be interested in working with them. Making comments on their posts such as “Great photo!” or “That looks delicious” will show up in their feed. In turn, it begins the start of a positive relationship that could benefit you down the road when the time comes for your to ask them to promote your restaurant. To finally reach out to them, you can send them a direct message or email, detailing how the partnership will benefit them. Things you give them could include a free meal for a review or compensation. Choosing a restaurant social media influencer should be included in your marketing budget and plans moving forward to begin attracting new customers. Because their business – aka their influencer status – is so important to them, they won’t pick just any restaurant. You want the influencer to be so excited about your food and service that they would share the experience even if they were getting nothing in return.